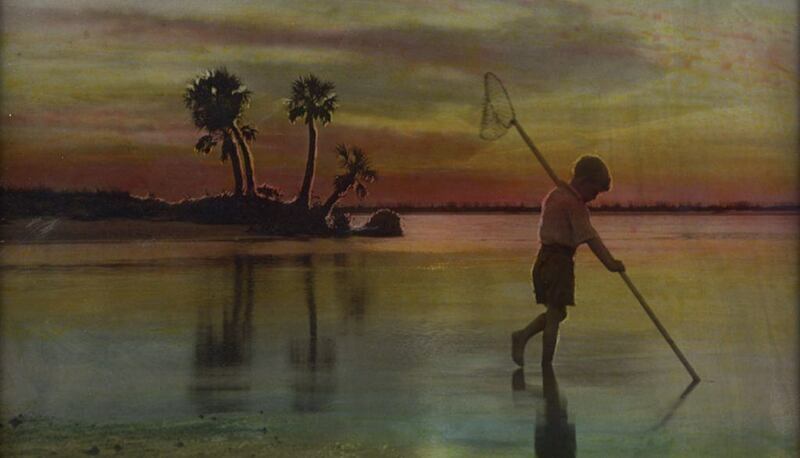 The hand-painted photographs of E. G. Barnhill (1894–1987) offer a unique voyage into the natural splendors of Florida during the early part of the twentieth century. An artist, photographer, businessman, and adventurer, Barnhill arrived in St. Petersburg in 1913. He set up numerous businesses hawking cameras and hand-colored photographs on paper and glass. Much of his work focuses on St. Petersburg, as well as other locations around the state, augmenting the natural beauty with heightened colorization. He claimed to be, “the only man in America to use the photographic process of uranium dyes on glass.” He learned the painting technique from famed photographer Edward S. Curtis as a teenager and later sourced the supplies directly from Germany before anyone understood the element’s radioactive potential. Falling somewhere between photography and vernacular art, these “glowing” works combine ethereal beauty with Barnhill’s unique sense of showmanship. The exhibition will consist of historically framed hand-painted glass plates from the collections of Gary Monroe, Dr. Robert and Chitranee Drapkin, Michael Turbeville, Kathy Turgeon, and San Antonio Antiques, as well as a selection of paper prints from the MFA collection.